Your holidays in the mountains of East Tyrol in Austria. We are happy to welcome you on our farm in the mountains on a hight of about 1.700 meters. 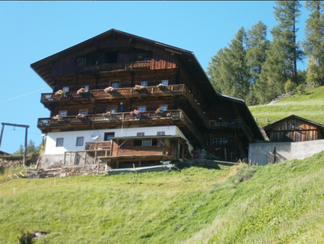 You can rent a holiday room for two or three people with a bathroom and a balkony from where you can see down to the valley Villgraten. From our farm you can go hiking and mountainbiking. In winter you have the possibility to go skiing and sliding in the ski resorts near to our village for example the famous Dolomits Ski Resort. In Innervillgraten are some nice ski touring and sliding routes. You can reach us by car. 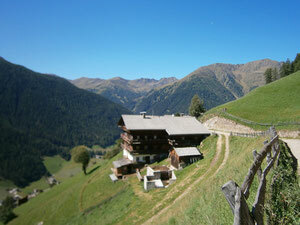 Our farm is about 4 km from the village Innervillgraten. By train you go till Sillian. From Sillian to Innervillgraten you can go by bus or we offer you to drop you by car. Here in the mountains you have peace at all and fresh mountain air. If you have little children, we can offer you a cot.